When I started writing again a couple of years ago, I rediscovered something I had long since forgotten—the semicolon. It hadn’t gone anywhere; no, it was there all along, just sitting there on the sidelines waiting for me to pick it back up and start using it again. And now that I’m back to writing, I find myself wanting to use it all the time; I think I’ve become addicted. The thing is, the semicolon is such a convenient piece of punctuation. It allows you to connect two sentences that otherwise you’d have to separate with a period, or put some separation between two thoughts where you may have instead put a comma. Hell, you all know what a semicolon is, I don’t know why I’m explaining it. The point is I love it, and I think I may be overusing it. That’s not to say I’m using it incorrectly; as far as I know it’s grammatically correct wherever I decide to plunk one down. The problem is simple overuse. Maybe it’s because, like I said, I had forgotten about it for so long that now I’m excited to ‘make it rain,’ so to speak. Maybe I think it makes my writing look more impressive and “writer-ly”. Maybe it’s both. All I know is that in this blog post alone I’ve already had to resist putting in a few semicolons because it would’ve been repetitive. I suppose in a way that’s a good thing. Since I know I’m throwing around semicolons like confetti in Times Square on New Year’s Eve, I know to look my stuff over when I’m editing to see if a period or a comma would better serve the sentence. What I’m noticing, though, is that semicolons are just the beginning. I was bothered whenever I wanted to use a dash—all I could find was the simple hyphen. It never looked right compared to books I read; even if I put two of them together or put a space before and after one, it just looked odd. Then one day I stumbled upon the end to my punctuation woes: the magical em dash—it was what I’d been searching for all along. After a little digging on how to actually type one, since it doesn’t have its own key—it’s shift+option+dash for Mac users—I’ve been using em dashes all over the place: in place of parenthesis, when a character is interrupted mid-sentence, for a dramatic break in a sentence, you name it—I love it. I’m like a kid with a new toy. I also have a tendency to want to put parenthesis everywhere too (em dashes have helped in that regard, though), but they’re easier to keep at bay. Same goes for the colon, too: they’re fun to use, but it’s easy to tell when you’re overdoing it. Does anyone else out there have this issue? Do you find yourself falling back on certain punctuation marks again and agin? 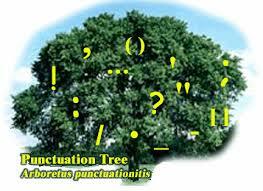 What punctuation problems plague you? PS—anyone wanting a refresher in proper use of the semicolon should read this entertaining guide to it’s use, courtesy of The Oatmeal. This entry was posted in Writing and tagged colon, em dash, grammar, parenthesis, punctuation, semicolon, Writing. Bookmark the permalink. I actually get teased by a grammar-hound I work with on a regular basis for my use of commas. For me, when writing the style of novel I typically read, it has a lot of run-on sentences and is very “flow-y”, as the aforementioned friend says. It’s not to say that it bugs me when people do or do not use commas, but I know that I am pro at run-on sentences and commas tend to just fly from my fingertips when typing. I have never had a big love of semicolons, but give me a comma any day! Commas are the only thing I have to remove from my writing rather than replace. I seem to just drop them randomly when I’m writing a rough draft. But then when I do use a few it can really have a neat impact on the rhythm of the paragraph it’s in. I have found myself writing relatively short sentences, and at the end asking “semi-colon?” No, I don’t need it here. The first requirement is there though, short sentences. I can’t say why. When I do replace semicolons it’s usually with a period. I like short sentences when I’m trying to get a point across. Thanks for reading! Ah, I’ve been a lover of the dash for years. I’m pretty certain that I overuse it, but it’s my favorite piece of punctuation. I have to say, too, that I do miss the Oxford comma. I’ve discovered, through editing Bella’s school papers for the past several years, that schools don’t teach it anymore. I’ve added it in to her papers before and teachers have actually told her to take it out! I was writing and the little hyphen dash just didn’t look right, and I saw the proper dash in a book and became obsessed. I can’t believe teachers don’t know better with regard to the Oxford comma. It’s one thing not counting someone off for not using one but surely you shouldn’t mark someone off for actually using it! I LOVE THE SEMICOLON! Long live the Semicolon! Use it proudly and properly! I’m an em-dash user as well, when I can remember to get the correct dash in my document. I have a tendency to use … A LOT! Maybe? I should use the semicolon instead? IDK….. lol! But when I want to say two things that are related but I don’t want to start a new sentence I will use …. I will rethink the semicolon…. When I type messages to friends on Facebook or at work on our instant messenger I always use that. I guess it comes in handy for me when I’m putting a few different thoughts into one message. Give the semicolon a chance and it’ll become your best bud; or your worst enemy. And good work on the site overhaul! I like the new layout a lot. Oh, and Happy New Year and all that jazz! Thank you so much for commenting on the site. Despite senior citizens’ claims to the contrary, I’m not “good with computers.” It took quite a while. I also appreciate you acknowledging the low-brow nature of the title, I’m not sure if no one else mentioned it because they didn’t get it or just don’t like things that make them think of poop.